Adding new plants to your home or garden can be a great way to improve the aesthetics or the air quality of the area, but the cost of buying new plants can add up quickly. Fortunately, many varieties can be propagated to create entirely new plants from an existing plant. One plant that is easy to propagate and care for is the Agave attenuata, which is a desert plant that's part of the extensive Agave family. To propagate your own Agave attenuata, all you need is a set of scissors, some soil and, of course, a mature Agave attenuata plant. Also commonly known as the fox tail, Agave attenuata is a succulent plant native to Mexico. Agave attenuata plants are short and wide, growing low to the ground, and they make for excellent ornamental additions to gardens that receive ample sunlight. 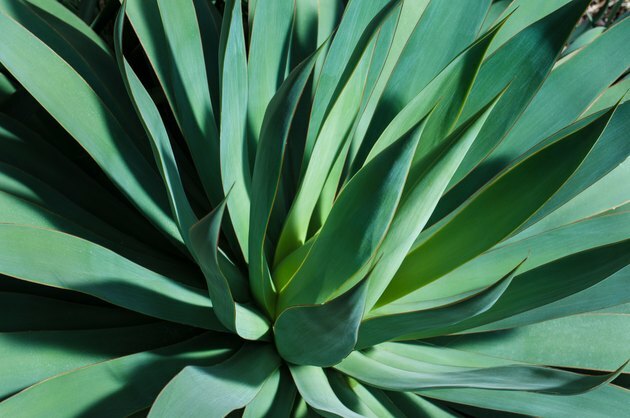 Desert plants by nature, Agave attenuata can fare well with minimal watering, but it is recommended that you offer your plant a healthy drink of water about once a week or so, especially during warmer months or if your plant sees direct sunlight for a good portion of the day. To propagate Agave attenuata, you won't need much except for a few basic gardening items. Most importantly, you will need a mature Agave plant to begin the propagation process. Agave plants ready for propagation may have smaller "pup" plants growing alongside the larger one, or "suckers," which are long, tendril-like growths that shoot up from the bottom of the plant. Additionally, you'll need some gardening shears or scissors, a pot with soil or a spot in your garden ready to host a new plant and rooting hormone, which is optional. One way to propagate Agave attenuata is by separating pup plants from the mother. These pups appear around mature Agave plants and appear as smaller versions of the same plant, usually found near the base of a large stem. How do you separate Agave pups from their parent? You can cut the pup at a slanted angle away from the larger plant. When cutting, take care to leave a bit of the stem that attached the pup to the parent plant, which will provide a healthy area for the new roots to form. Once your pup is separated, allow the cut part to air dry until a hard callus forms over the area, and once that end is hardened (which could take anywhere from several days to a few weeks), place it in a container of soil deep enough that the pup is supported and won't fall over. If you're wondering how to grow Agave attenuata from seeds or pups, but you either don't have any or are hoping to enjoy a fully grown plant sooner, you can propagate a new plant from an existing one in a few easy steps. Luckily, some plants have mechanisms in place to help propagate themselves, the Agave attenuata being one of them. These plants naturally grow long protrusions known as "suckers" from near their own base, which grow upward and outward, resembling an elephant's trunk (which is why they're sometimes referred to as the elephant trunk plant). If your Agave attenuata has sprouted one or more suckers and you wish to repot them to make new plants, carefully pull the sucker away from the parent plant. Then, give them a little time to dry out, which will reduce the risk of your new plants acquiring root rot and oftentimes resulting in an early death. Once they've dried out, repot them in a container or elsewhere in your garden, and be sure to offer your new baby plant plenty of water and sunlight during the growing stages.